If you don’t want a laptop or desktop PC cluttering up your living room, but miss the emotional tech attachment, then Sony may hold the key. It has designed a PC specifically for the living room, but one so, well, un-PC that it’s sure to put bums on sofas. First announced at the Consumer Electronics Show, Las Vegas in January, the machine has just begun shipping in the US. 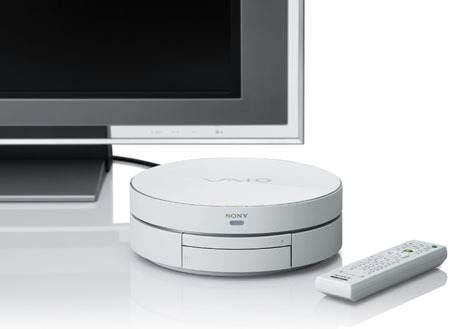 The circular Vaio VGX-TP1 PC is more than just a pretty white shell and will sit well as a bedroom or lounge PC/DVD player. Running on Windows Vista Premium, it combines a 1.83GHz Intel Core2 Duo CPU, 2GB of DDR2 memory, with a clock-speed of 667MHz, Intel’s 945 GM chipset and a 300GB hard drive. The machine can be connected to your HD display via HDMI and also has interfaces for DVI-D and VGA out. Wireless connectivity is provided over 802.11 versions b and g, while an optical drive supports a variety of formats, including DVD+RW and CD-RW. But there is no mention of Blu-ray support, which is surprising given Sony’s fondness of the HD format . A curved slide-away panel on the machine’s front hides a myriad of additonal ports, including 4 USB 2.0 ports and an SD-card reader. A slot to support Sony’s Memory Stick Pro and Duo is also built-in. The machine also comes with a number of added extras, including a matching white wireless keyboard, with electro-static touchpad, and a remote control, for that true living room feeling. Sony’s Vaio VGX-TP1 is available now in the US for around $1,600 (£788/€1,172), but there is no word yet on a UK release.